Today’s DI-led session on Joined-Up Data is an important first step towards joining up the dots across sectors, sharing learnings and combining forces to solve common problems. It is the first time that the Construction Sector Transparency Initiative (CoST), Extractive Industries Transparency Initiative (EITI), Global Initiative for Fiscal Transparency (GIFT), International Aid Transparency Initiative (IATI) and Open Contracting have shared a panel to talk specifically about cooperation. To get the discussion off the ground the Open Knowledge Foundation has prepared a scoping paper that we are publishing today. The study compares the work of these five initiatives, mapping their differences and similarities and suggesting areas in which first collaborative steps could be taken. The initiatives have much to learn from each other. The challenges EITI have overcome to standardise country-level reporting has much to inform top-down activities such as IATI. Implementation strategies differ from sector to sector. The five cover the full-spectrum of approaches to standards: from GIFT’s development of principles down to IATI’s highly structured publishing schema. What the study suggests, and what we hope to get out of today’s meeting, is for the five to roll up their sleeves and grapple with a few practical issues as a first step in collaboration. 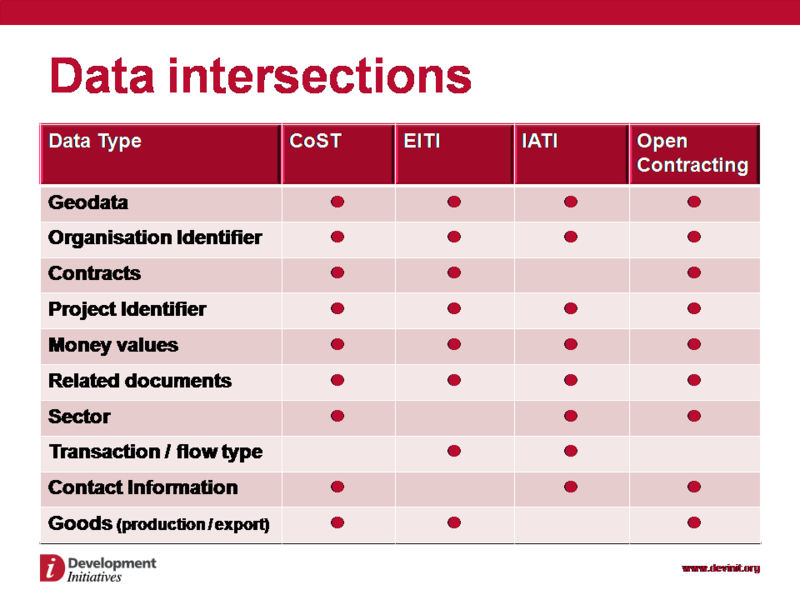 Rather than general discussions on standardised data, a building-block approach is proposed. If agreement can be reached on common solutions to specific issues that are relevant to all initiatives this will lead to the steady growth of interoperability over time. 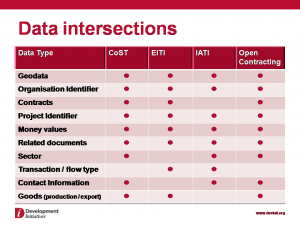 Three areas have been highlighted for focus: Organisation identifiers, sub-national geographic referencing and contracting. We will highlight each one of these in a series of blogs to follow.